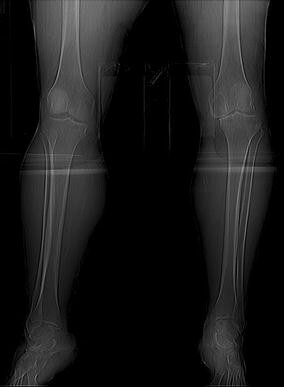 A 44-year-old female with HIV, type II diabetes and diabetic neuropathy presented to the emergency department with 2 days of left lower extremity pain and swelling. She denied chest pain, shortness of breath, trauma to the lower extremities and any history of deep vein thrombosis (DVT). Physical exam revealed pain over the anteromedial thigh, popliteal fossa and posterior calf. The pain was exacerbated by flexion and extension of the knee and ankle. An ultrasound of the left lower extremity (Fig. 1) did not show a DVT, but anechoic fluid tracked along the anteromedial calf between the gastrocnemius and semimembranous muscles. A subsequent computed tomography image (Fig. 2) demonstrated a loculated cyst at the distal point of insertion of the semimembranous muscle and fluid tracking distally around the gastrocnemeus and lateral to the soleus muscle down to the ankle. A calcified body could be seen in the area of loculation, suggesting arthritic changes of the knee joint. Radiology determined this finding to be a probable ruptured Baker’s cyst. Baker’s cysts are caused by fluid distention of the gastrocnemio-semimembranosus bursa and result in a painful synovial-lined fluid sac outside the knee joint. The most common underlying conditions are osteoarthritis (Fig. 3) and Charcot joint. The differential diagnosis includes DVT, tumor, hematoma and cellulitis . Baker’s cysts may be confirmed by ultrasound, CT and MRI. Incidental findings of an asymptomatic Baker’s cyst do not require treatment and will resolve on their own. Painful cysts can be treated with intraauricular injections and needle aspiration.